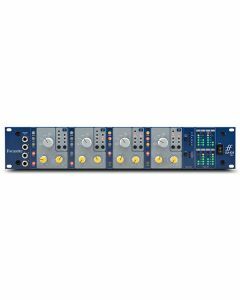 Focusrite’s ISA428 four-channel microphone preamplifier delivers the Focusrite trademark sound at its lowest cost per channel to date, supplying four original ISA transformer-based preamps in a single sturdy two unit chassis. The four ISA-series transformer-based microphone preamps make use of the same archetypal microphone preamplifier design as the original ISA110 module from Focusrite's legendary Forté console (including the original Lundahl L1538 transformer and bespoke zobel network). The preamps are supplemented by four line inputs, four line outputs and a further optional four channel 192kHz A-D converter boasting a dynamic range of 122dB. The ISA428 also combines speedily and effortlessly with ProTools HD, and other popular hard disc recorders and mixing desks, because of its widely-compatible 25 pin D-Type connectors. The microphone input stage also features a variable impedance circuit, providing the user the opportunity to alternate between four well thought out selected input impedance settings. The original ISA110 setting is complimented by three more impedance settings to either faultlessly counterbalance the preamp with a microphone, maximising level, or to use diverse settings creatively to sculpt the sound of the microphone being used. High and low impedance options are present on the four front panel instrument inputs to deliver a complete and accessible DI solution. If the need arises to position extra processing between the preamp and converter insert switches feature on every channel. Each channel provides vintage design 75 Hz / 18dB per octave high pass filters, making certain that unwelcome low frequencies are essentially eliminated. Meters (6 LED meter is calibrated 0dBFS = +22dBu (the maximum level which can be correctly converted by the optional internal A/D converter before overload occurs).